Hi Simon. Glad to be here. No traffic on a Sunday. And yes a fairy cake or two would be great. I chose ‘Ruby’s Spoon’ as it caused rather a stir in the publicity world when it came out in hardback and then sort of vanished. When I saw it at the time I heard it had witches and mermaids in it and do love an adult fairytale, would you say that is a fair summation having read it? What were you expecting? I missed the stir so I hadn’t heard of it, but the reviews I read were good. 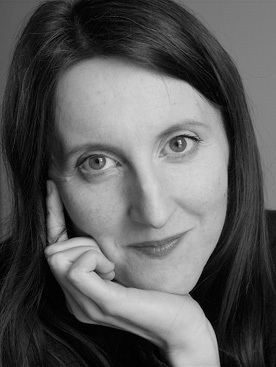 I can’t say ‘adult’ and ‘fairytale’ really do it for me – I have a young daughter and have my fair share of mermaid stories such as ‘Ingo’ by Helen Dunmore. But I did go through an Angela Carter phase once and thought, hey, why not? Being in Scotland, and ignorant of most of England’s geography, I can’t say I even knew where Black Country was, but just the words, ‘Black Country’ did summon up something magically sinister. Did you like it? I did though I did think that it was a little bit on the long side, is that unfair? I found a lot to admire in it. Bit it was way, way too long and I really struggled to finish it. If I hadn’t been reviewing it for you, I don’t think I would have. I don’t know how many thousands of words, but it felt like it was at least three times the length of most novels. I will admit the prologue made me think ‘uh-oh this isn’t going to work for me’. It didn’t seem to make any sense. I knew there was a witch on fire but apart from that I was stumped. In fact I was almost geared up to not like it. What was your reaction as the book itself, and the story, seems much clearer, in comparison to that? I liked the opening. I found the writing brilliant, the descriptions vivid and unusual. If only she had changed gear for the rest of it. The whole novel was like the opening – tantalizing but elusive, coy and yet almost completely incomprehensible. There seemed to be almost no story, only description and revelation, exposition and exhaustively written detail. Everything was given the same weight – a lengthy description of a walk along a path and then a crucial plot twist. It was all so convoluted. I felt as if weeks had gone past only to find it was only days. And yet I loved the setting, the industrial landscapes and the button factory, the character’s names -Trembly Em, and Moonie Fly. It seemed that the writer had all this great material and yet didn’t know how what to do with it. It didn’t hang together at all for me – it was like listening to someone give a very poor rendition of the plot of a very good film. And then, and then, and then. Aaaaaagh. Sorry, I need some more tea. I too wanted to know more. At first. But there was too much assumed, don’t you think? Why did Ruby want to go to sea so much? Also, with such a classic set up – stranger in town – the expectation is that something will happen. Most of what happened had already happened in the past. It was mostly an uncovering of old stories rather than being driven by anything current. I became rather annoyed when I realized that the hunt for Lily Fly was just a red herring. Ultimately though, I’m afraid that I was unable to suspend my disbelief and found my self having to drag myself through the story rather than being picked up and swept along. Yes, I know what you mean about the revelations being more in the past than in the now, that’s a very good point. I couldn’t say I was dragged though, whilst I didn’t devour the book (I actually had other books I would turn to in order to give myself a breather) I did enjoy it once I picked it up ahain. A lot of the book relies on us having to empathise with or just enjoy spending time with Ruby. I worried that I just wouldn’t be interested or would find her a precocious type of early teenager, I couldn’t have been more wrong, she charmed me. Did she charm you? I liked her, yes, but wasn’t enchanted. I didn’t feel as if I knew her well enough. I couldn’t get under her skin but that was because of the writing. We kept on being told that she was enchanted by Isa Fly but I couldn’t really feel it. Likewise, she keeps asking questions – surely this is the reader’s job rather than the main characters? She seemed a little like a device. Ooh, I hadn’t thought about that side of it. Yes, now you mention it she does ask a lot. But then I thought that might be so the reader learnt more. There is the slight concern if a character is asking too many questions there is something amiss somewhere I guess. I have to admit I did get a bit confused about the water initially. Not just because Ruby was so scared for it, which initially I just didn’t get, and because of the way it surrounded the area of Cradle Cross (brilliant name) in the middle of the Black Country which was landlocked too… erm, what? I didn’t think the map really helped me, I just got more confused. I like maps in books. Although I now realize that didn’t I glance at it once as I was reading. It wasn’t the geography of the place that confused me but the geography of the plot. Yes, it makes you wonder if the publishers panicked at the last minute that no one would understand it. I also struggled with the dialogue at first but I did grow to like it. It gave the novel a real flavour and nuance. You could really hear Ruby’s voice really clearly. I liked that. What I also sometimes struggled with and also really loved, weirdly, was the magical elements of the book. They added so much and yet slightly distracted too. Can you tell I feel a bit mixed about the book (I think I need it to settle with me a bit more) overall? The juxtaposition of the gritty northern landscapes and mermaids and witches didn’t work for me at all. I felt it meant she could just keep changing the goalposts . Surely the 1930s was enough? I felt all the witches and mermaids stuff undermined the serious detail, the widows and their losslinen and absent men. Did it need more? I would have found it far more moving and involving without the magical elements. I thought the shades of the WWI in the background adding a real tension and spooky element, especially with all the widows in the town, really added something to the novel, did you find that? It made the book seem more magical, oh I don’t know how to put that into words… can you help using your writing skills Beatrice? I liked all the WW1 stuff and the period detail too. An awful lot of work clearly went into the research and you get a sense of the real visceral joy that the author had in the details. And yes, it feels like a community very much in decline – times are changing. Now the start is sort of the ending, did you like that aspect of the book or did it sort of mean no matter where the author took us, and the mystery as we mention throughout is wonderful, you already know what is coming. How did you feel at the end? Glad to have got there. No seriously, the book has real resonance and a lovely flavour. The voice, the descriptions, the brilliant writing and all that detail about Cradle Cross stayed with me. I now wonder if the author was deliberately playing with plot, with expectation of a what a plot should be? Can all the story be in back story? I don’t think so. It made me realize that what I love in novels is a good story, one with action and character development. Beautiful descriptions, evocative names and interesting narratives are nothing without a narrative that hooks you and a character who in solving a mystery is also digging deep into themselves. I wish I had been moved at the end. Sadly, I wasn’t. I’d love to read something shorter by the same author, however. I think she has a huge talent. It’s always hard to balance research with the constraints of the plot. In the end, however, you have to be brutal. Less is always more and space is as important in a book as detail. Hopefully her next book will be shorter, simpler and will give her characters room to breath and come alive. Well thanks for coming and chatting Beatrice, do stick around in case anyone else pops by for a natter. In fact, I better get some more cups of tea on the go and more fairy cakes out and we can see if anyone wants to join us for more bookish discussion over afternoon tea, let’s see if any of them have anything to add or discuss. Can you believe March has almost been and gone, is it me or is this year going incredibly quickly? So as with February here is my review of the month as a whole. 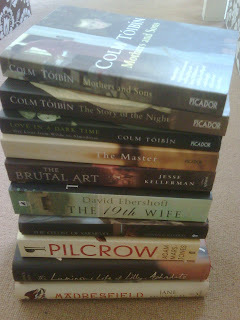 It has to be said on the whole it was a really good reading month, a very diverse range of authors and genres of books. March has been quite influenced by Richard and Judy looking back, mind you now their reads are over next month will be quite different, I still have The Cellist of Sarajevo to go though. I have also travelled a lot going to Los Angeles, New York three times, Russia under Stalin’s regime and the aftermath, Germany during both wars, in the land of theatre twice, strolled through Paris with Edmund White and been to Wonderland. It’s no wonder that I am shattered. 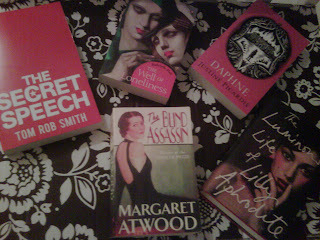 Books read: 12 which I think is a record. Books added to the TBR Pile: 46 though I have absolutely no idea how that happened. New author I tried and want to read ‘the works of’: Tom Rob Smith, and I did, all two. Book of the month: Ok this month there are three. The Luminous Life of Lilly Aphrodite by Beatrice Colin, Child 44 by Tom Rob Smith and The State of Happiness by Stella Duffy which you all have to read. I am excited about what April will bring. It already seems a promising month as I have started The Secret Scripture by Sebastian Barry and it seems like its going to be a complete corker what more could I ask for at the start of the month. Now this leads on to the next topic of my blog The Orange Prize. The long list has been announced and I have one (Blonde Roots) and heard of three others (Burnt Shadows, Girl in a Blue Dress and The Lost Dog – the latter two were long listed for the Man Booker last year) here is the full long list. They sound like a real mixture of books and I so want to read every single one. Is anyone planning on doing the Orange Challenge and reading the whole long list or will people be waiting until the short list is announced? I have to say just from the cover I wasn’t sure what I was going to make of this novel. It looked like it might be a bit ‘chick-lit’ not that there is anything wrong with that by the way, just that it isn’t really my general cup of tea. I was actually sent this book ages and ages ago buy the lovely people at John Murray and despite a phone call raving about it from one of their delightful team I was still suspicious. It went to the bottom of the TBR I am ashamed to admit. However it has been this weeks Richard and Judy choice and as I am doing the challenge I picked it up, dusted it off and tried it out. I absolutely loved it. Lilly Nelly Aphrodite is born just before midnight on December the 31st 1899; however she doesn’t actually take her first breath until one minute past twelve taking her first breath in the first minute of the twentieth century. Instantly you know that Lilly isn’t going to be your typical child and as a baby with her extremely vocal lungs she proves her point further. Things don’t start well for Lilly as within months her mother, a cabaret singer, is killed under scandalous circumstances. We then follow Lilly as she goes through her childhood as an orphan to becoming a major German movie star. Now if your like me that final line would have made you think ‘chick-lit’ however with the background being Berlin and the timescale of the novel being from the start of the 1900’s until the mid 1940’s what you as the reader witness is war torn Germany… twice. Lilly is a wonderful set of eyes through this period as she has no real political streak, her only actual desire is to survive and through this you are given an insight (very realistically) into what life might have been like through such a horrific period in history for the general/poor public of Berlin. That isn’t the only historical facts that Colin focuses on, there is also the heyday of the Weimar Republic and the rise of Hollywood and its golden era. How she manages to make all this work is quite a feat but it does. Lilly is a wonderful character. She rightly steals the show… well book as she is witty, manipulative, wily, funny, naughty, kind and incredibly strong. Though she goes through endless turmoil she doesn’t wallow in self pity, well only occasionally, and instead she fights resolutely and carries one. Naturally she is flawed and makes several mistakes along the way but all in all you can’t help to admire her and like her, maybe a little less towards the end, but I don’t want to give anything away. If Lilly isn’t enough I have to praise the characters that come and go, and come back. Eva is a wonderful character though in the end completely dislikeable you want to read more and more about her, especially the more conniving and bitter she gets. Hanne however almost steals the whole story from Lilly; she is a wonderful character a fighter like Lilly only much harder and much darker with a real self destructive streak. In fact it’s the women all in all that shine and take the main roles in this novel. Though not in the forefront of the novel the men are all there and very complete characters, in fact sometimes Colin does a wonderful trick of having a character say one line and then following it with what happened to that one small character in the rest of his life in the next single sentence. It was in fact this quality that made me think of great authors like Charles Dickens, Wilkie Collins and Mary Elisabeth Braddon etc. In fact in many ways some of this novel reminded me of books like Moll Flanders or Tess of the D’Urbervilles in the fact that every character no matter how small has their part to play and their story to tell no matter how big or minor their role was in the general tale. The only other two authors I can think of that do that now are Sarah Waters and Jane Harris and if you like any of their work then you are sure to absolutely love this. As you can tell overall this for me was an absolutely marvellous book. The setting richly painted like the make up on many of the wonderful characters faces. I simply cannot find a fault with this book and think its one that many, many people will be getting copies of for birthdays and one that I can’t wait to re-read and take it in all over again…Though with my TBR that may not be for some time. I am off for a bit of a break this weekend and Monday so there maybe some Savidge Reads Silence for a few days but hopefully not too long. I am off ‘oop’ north to the homeland to see some family and escape London life for a little while. Due to the delights of London Transport this trip is going to take around 3-4 hours each way and though its a slight drag the good news is that it means that I will be able to get some serious reading time in. The likelihood of delightful sunny views being low from the weather reports. Which ones would you have chosen or would recommend? So which two did I take? Can you guess? Well all will be revealed when I get back, but do let me know your thoughts… oh and what weekend read do you have planned? Have a lovely weekend!